Possible Alzheimer Treatment With "Helmet Therapy"? Interesting news on the science front: Although it doesn’t look very fancy, futuristic or anything like a medical device, this experimental helmet could possibly be used to treat Alzheimer’s. 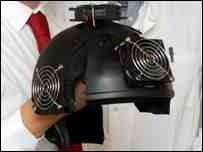 It works by delivering low levels of infra-red light which may stimulate the growth of brain cells. It’s already been tested in mice with promising results: they showed improved learning ability. A study in humans is due to begin in summer. This entry was posted on Friday, January 25th, 2008 at 5:45 pm	and is filed under Science. You can follow any responses to this entry through the RSS 2.0 feed. You can skip to the end and leave a response. Pinging is currently not allowed.